Of all the places to get cancer, the pancreas may be the worst. Difficult to detect and nearly impossible to treat, pancreatic cancer is the only major cancer with a five-year survival rate below 10 percent. New research, published Wednesday in Nature, challenges some widely held assumptions about the disease and could eventually help doctors diagnose patients earlier, when treatments are most effective. The study’s findings came from investigating how early pancreatic tumors affect peripheral tissues — mainly muscle and fat — in both mice and humans. Doctors have long observed that many pancreatic cancer patients experience debilitating tissue wasting. Researchers have been working to stop or even reverse such loss, although they still don’t understand the biological forces that drive it or whether reversing tissue wasting improves survival. One leading hypothesis is that pancreatic tumors release a chemical signal or factor that travels throughout the body promoting the breakdown of muscle and fat. However, the new study — by a team of scientists from the Koch Institute for Integrative Cancer Research, the Broad Institute, and the Dana-Farber Cancer Institute — suggests otherwise. During a key experiment, scientists implanted early-stage pancreatic tumors into different body parts of otherwise healthy mice. Tumors under the skin did not cause tissue wasting, arguing against the idea of a circulating chemical signal. In contrast, tumors placed in the pancreas caused dramatic decreases in fat tissue. Further analysis demonstrated that the tumor had interfered with the pancreas’ ability to secrete digestive enzymes. Unable to obtain enough nutrients from food, the mice had entered a mode of starvation in which their bodies broke down peripheral fat to survive. More surprisingly, additional experiments suggested that peripheral tissue wasting, when it occurs early on in cancer development, is not necessarily a bad omen for mice and humans. When scientists fed cancer-ridden mice food supplemented with pancreatic enzymes, they were able to prevent loss of fat tissue. Despite this, the supplemented mice did not live longer than their counterparts on a normal diet. Concordantly, analysis of medical records from 782 human patients drawn from five different hospitals showed no association between their degree of tissue wasting at the time of pancreatic cancer diagnosis and length of survival. 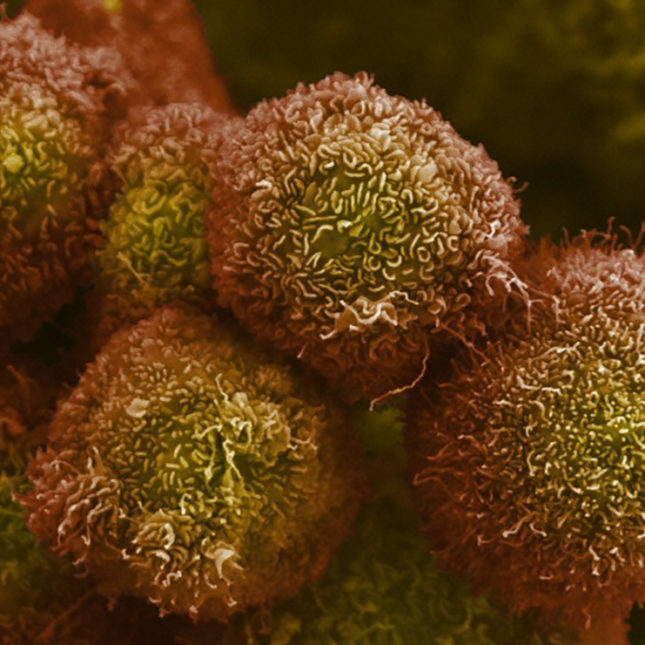 According to Dr. Matthew Vander Heiden — one of the paper’s senior authors, a member of the Koch Institute, and a physician at Dana-Farber — the results don’t rule out old ideas but open up new possibilities for how pancreatic cancer and tissue wasting affect patients. According to Lynn Matrisian, chief science officer at the Pancreatic Cancer Action Network, one of the most exciting implications of this study is the possibility of using early peripheral fat wasting as a warning sign for pancreatic cancer. Because pancreatic cancer is so aggressive, by the time the initial tumor is detected, cancer cells have often spread to other organs. To improve detection, scientists have been trying to understand tumor characteristics that will allow for early diagnosis and give patients an increased chance of survival. In a previous collaboration, Wolpin and Vander Heiden demonstrated that signs of muscle wasting could be detected in a person’s blood up to five years before they were diagnosed with pancreatic cancer. Whether changes in fat and muscle composition also occur at such an early stage remains to be tested. Wolpin and Vander Heiden also want to uncover why tissue wasting happens and its effect on patients. It remains an open question whether tumors in humans are preventing the pancreas from releasing digestive enzymes, as is the case in mice. Similarly, results in mice raise questions about the practice of preemptively prescribing pancreatic enzymes to prevent tissue wasting. More studies and clinical trials are needed to determine whether helping patients avoid fat loss early on in their disease progression is helpful. For Vander Heiden, the main takeaway from the study is the importance of understanding cancer in detail, regardless of what organ it began in or how far the disease has progressed. In cancers that secrete factors triggering tissue wasting, helping patients gain weight could be helpful. Other cancer patients may have tissue wasting caused by a different mechanism, which actually helps them survive. Correction: An earlier version of this story misspelled Dr. Jeffrey Drebin’s last name. I am very interested in this article. I have had the opportunity to meet individuals who were diagnosed with pancreatic cancer and was informed by their doctors that they had only a few months, or however long each person was diagnosed and told their lifetime until they would pass on. Also, I have met many individuals who were diagnosed with pancreatic cancer and they did indeed not survive longer than a year, at the longest. The cancer of the pancreas is still one of the most difficult types to provide a long time left to live; the one exception was the woman who was still alive seventeen years later. I really thought at the time that she was misdiagnosed and I am still unable to accept her reality of living and cured from pancreatic cancer. I have met many who have been told that they have months to live, and over twenty plus years are still here and doing very well. I am fine living with the mysteries of life, yet I would rather know the entire reason for so many different outcomes of individuals who I know personally. Also, as a researcher myself I want know the science behind the diagnosis and the treatment along with the statistics that were used for the research replicated by others that confirm the data. I am hoping that the research that doesn’t have the same outcome, also are finally reported so that the next research conducted would have more information about the data results of both. Hi Catherine Dunn: It seems information everywhere about this disease is not definitive. It depends if the cancer is in the head, or the tail. Tail cancer tends to spread because it is not involved with the ducts associated with digestion, so it is often symptomless. My sister’s PC was detected because she had pain as in a gall bladder attack, and was also producing fatty stools as lipase production was interrupted. She was told she has a very small tumor in the head and was a candidate for the Whipple surgery. Information online including that which she heard from her daughter-in-law, a nurse (they are NOT scientists) said she has a lethal cancer and she is likely to die soon Whipple or not, and that the surgery could kill her (thanks nurse). So although she was told this surgery would likely be even curative, or at the least she could get 5-10years of life (she’s 68) she opted out! So as a researcher Ms. Dunn you can see there is a myriad of info out there that is not necessarily valid. The doc doing the surgery has a great success record, and a doc at I think MGH or Brig&Womens, Dr Tenz (spelling?) is world-renowned. PC has not been studied because it has been relatively rare when compared with others more common. However, PC is expected to increase heartily within the next decade. If you are a doc, you have your hands full with this disease, for all the reasons previously described. I am a lab researcher retired, not a doc, but loved the work..very basic stuff compared to what is happenimg now. Best of Luck! My sister has pancreatic cancer (head). Wasting occurred secondary to her inability to digest lipids, in spite of subsequent enzyme use. Her symptoms (abdominal pain) keep her in constant vigilance about what foods to eat, so she ate very little so as not to exacerbate her pain. Opioid painkillers diminish patients’ desire to do anything, even eat. She became extremely gaunt. It will be very difficult to pinpoint a circulating factor to somehow develop early detection. It seems there are too many variables. Firstly I am so sorry about your sister. I have been in your situation with a few family members who opted out of trying the surgery because of the ages of those affected by pc, and a few other diagnoses that are life threatening for them. I am also not a physician, nor do I have any more opportunities to be in a lab, and I wasn’t in the lab as often as yourself; I was going to a medical university for an adjunct degree in my professional life as a phycotherapist with my masters degrees in Psychology and a marriage and family therapist. I was studying for my diploma as a Jungian Analyst, and was two plus years into my earning my diploma, when my husband was transferred from our home to move thousands of miles away. Thus I have not been able to return to my studies, and returned to my Psychotherapist profession, along with my own continued self studies in the Jungian Analyst syllabus myself, and I continued the supervision with my training Analyst over the telephone for years each week. I almost went to the university at Davis, to continue my studies there ( in CA ); but we were again transferred to a different state back to the east coast, in florida. I am still nevertheless involved with a knowledgeable Psychologist and worked with him, in forensics and other research as well. I am still trying to get the professional research to be mandated to publish the research that have been confirmed and disconfirmed published so that the researchers have all data available to not have a problem with trying to avoid confirming an hypothesis that is not going to be effective in ongoing research studies. I know that I am not alone with this situation. It needs to be changed. I still have a keen interest in my studies and research the published results of various subjects and topics that are of interest to me. I want you to know that I hope that those who are loved ones especially are able to find some peace and support from the chronic pain and especially the medication that is prescribed for their conditions, because of the pharmaceutical companies who are being fiscally rewarded for medications that don’t really help the patients, but do add to their own company profits from the drugs that are not truly helping the patients who have no recourse except to try to get some modicum of relief, but certainly not enough. Best of everything for you and your family and friends who are diagnosed with serious health issues. My father passed away last month of Pancreatic cancer. He was diagnosed last October but I had noticed some weight loss for over a year and a half before. We attributed it to his diabetes being out of control. I think pancreatic cancer was brewing silently for a while. I hope they discover a way to detect it earlier. It is a horrible disease. Both my aunt and sister passed of panc cancer in their early forties. Both of them lost a substantial amount of weight approx a year or two before they were diagnosed or showed any symptoms. Always wondered if there was a connection. So sorry for that huge loss! Oddly, according to the premise of this, my sis did not have any obvious weight loss. She did not do well with chemo, and has opted out of Whipple surgery. She is taking pain-killers (dilaudid) and a fleet every three days for opoid-related constipation. She is just waiting to die. Awful!